As anyone who’s been on a boating holiday in Norfolk will know, windmills are a fixture of the county’s landscape. Built to help local millers grind corn and to provide power for water pumps on the Broads, these windmills and windpumps help to make the region even more picturesque. Visiting a few of these historic buildings during your stay on a boat on the Norfolk Broads is a fantastic way to enhance your trip and get to know the region a little better. Open every weekend from mid-April to the end of September, the beautifully restored Hardley Windmill is one of the most recognisable on the Broads. The mill sits on the banks of the River Yare and is accessible via the Wherryman’s Way footpath. The regular events that take place at Hardley throughout the summer allow visitors to get an even better idea about the history of the mill and the role it played in the economy of the local area. If you’re travelling by boat, you’ll find handy moorings on the river outside the mill, giving you the chance to sleep in its imposing shadow. Located around two miles from Hickling, Stubb Mill is a Grade II listed building. Unlike other mills in the area, this atmospheric building hasn’t been restored and so gives visitors the chance to see what these buildings were like before the renovations began. A good spot for bird watching, the mill is well worth a visit during your time on the Broads. Horsey Windpump is currently undergoing renovation. Although this limits access to the mill, it does give visitors the unique opportunity to see restoration work in action. Find out how the onsite experts are returning the mill to its former glory and learn about how the mill has changed during its 106-year history. If you fall in love with Horsey Mill, you can play a part in its restoration by volunteering on the project. 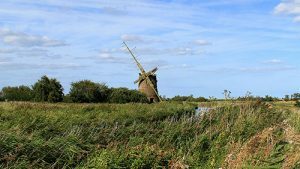 Located on the River Bure, Stracey Arms Drainage Mill is open to the public every day between Easter and the end of September. A choice of tasty refreshments can be found in the onsite tea room while free moorings are available on the nearby river for those travelling by boat. As restoration work at the mill is still on going, some areas may not be accessible during your visit. Check the National Trust website before your trip to find out more. 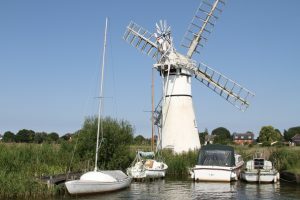 Part of the Wind Energy Museum in Repps with Bastwick, Thurne Mill is the perfect destination for anyone who wants to find out more about the history of windmills and drainage mills on the Broads. The museum is only open on the last weekend of the month, so make sure you check your calendar before you plan your visit. To find out more about things to do on the Broads, boat hire or moorings, explore our site or get in touch with a member of our team.